Moving to a virtual desktop infrastructure presents modern businesses with an opportunity to solve the traditional desktop management challenge: How to secure user data; support Bring-you-own-Device (BYOD); enable greater workforce flexibility through remote working; reduce the burden of desktop management and ultimately save the business money by reducing spend on under-utilized desktops and laptops. One of the key challenges for delivering a successful VDI solution is picking the right infrastructure that provides the needed linear scalability and performance to provide a superior user experience. Eurotech has combined years of experience in managed IT service delivery and enterprise solution implementation to provide a cloud-based VDI service, hosted in our secure and highly available datacentre. VDI-as-a-Service provides customers with a cloud-based desktop experience that allows on-premise IT staff to focus on value-adding services such as user and data management and application delivery rather than infrastructure management. VDI-as-a-Service eliminates the commercial and technical risk inherent in VDI projects and helps your business realize the full benefits of such a solution. Because it is delivered as an OpEx-based £/desktop/month model, there is no up-front CapEx investment needed. incorporating Nutanix’s Acropolis fully integrated hypervisor. Nvidia GRID GPU (Optional)—Pre-installed in the Nutanix appliance, the Nvidia GRID Graphics Processing Units (GPU) allow for 3D VDI sessions to be delivered to users across both LAN and WAN networks. solution, allowing for advanced desktop management features to reduce administrative overhead. 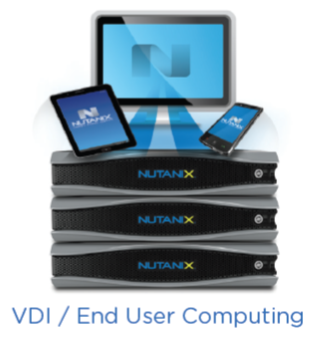 Citrix XenDesktop comes natively integrated with Nutanix Acropolis for VDI-as-a-Service. Eurotech will work with the customer to provide the needed network integration between the customer’s on-premise network and Eurotech’s cloud. This will include, where applicable, connecting the service into the existing Active Directory infrastructure. The customers IT team retains full control of provisioning and managing the Windows desktops with VDI-as-a-Service through a simple, single pane of glass management interface. Note: Desktop licensing is generally out of scope of the service and remains the responsibility of the end customer (if Software Assurance agreements are in place with Microsoft, no additional Windows licensing fees are required to make use of this service), however Eurotech can provide VDA licenses to deliver an end-to-end service stack. Minimum contract terms apply.